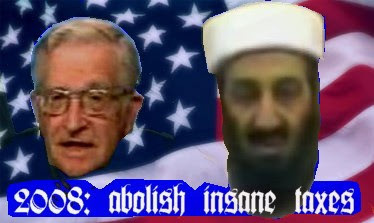 Video 1: Prof Osama bin Laden talks to Americans in 2007 (press play). See also the full transcript, full screen, better quality excerpt. "Among the most capable of those from your side who speak to you on this topic (the war in Iraq) and on the manufacturing of public opinion is Noam Chomsky, who spoke sober words of advice prior to the war. But the leader of Texas doesn't like those who give advice." Rick Perry could be somewhat sad. Well, I hope that these clear words will make the links between America's far left and the Islamic terrorists somewhat less controversial. "The life of all mankind is in danger because of the global warming resulting to a large degree from the emissions of the factories the major corporations... And despite this brazen attack on the people [referring to global warming], the leaders of the West - especially Bush, Blair, Sarkozy and Brown - still talk about freedom and human rights with a flagrant disregard for the intellects of humans?" Well, the voice of this authority should finally settle the debate! 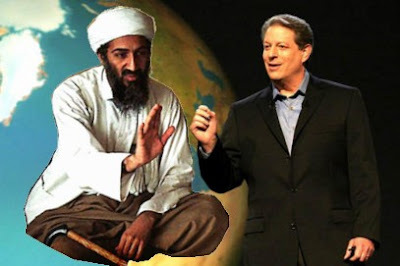 :-) Just like Rev James Hansen, Prof Osama bin Laden explains that global warming is accelerating. His brothers have the duty to continue to kill Americans in the Middle East while the main thing that Osama bin Laden demands from the Americans is to observe the Kyoto accords. :-) Various political topics are apparently linked. So is George Bush finally going to respect the dreams of Al Gore, Enron, and Osama bin Laden? Meanwhile, CIA claims that Al Qaeda is preparing new attacks. If Osama were born in the U.S. and if he had avoided various kinds of Islamic influences, he would probably become a standard "progressive". And in his new tape, he simply tries to win Americans on his side and to help the "progressives". In fact, I feel that he is kind of sorry about 9/11 just like any partially sane person would be after having done what he has done. I am pretty sure that these "progressives" do realize that they actually agree with him. But what Osama doesn't get is that it is simply impossible in the U.S. to publicly support him, perhaps the most famous killer in the world today. The assumption is that such a killer should be isolated and his opinions must also be sick. So despite his agreement, the effect of his tape will inevitably be to lower the self-confidence of his U.S. leftist allies.